Ever since I was a kid I loved the look of gears and the inner workings of machines. I didn’t even know what steampunk was back then, but I’d take apart broken watches and things that my parents were going to throw away anyway. I still have some watch parts I’ve kept all these years. I even have a bag of parts from an old adding machine! For some reason, even though I have loose watch parts, I decided to cast some cog shapes myself. It does give more dimension to the piece. I took molds of some of the old adding machines parts I have and then used polymer clay to make the cogs. The cogs were then covered with metallic powder and cured. 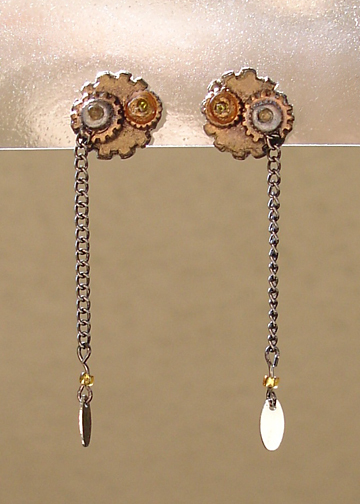 I added tinted resin to the middles them to give the appearance of cabochons or jewels dotting the center of each cog. The thin chain has a small amber bead and a silver oval-shaped charm attached to the bottom. I prefer the earrings worn so that the chain hangs down from the side. Seems to give the cogs a sense of movement that way. Like the machinery is in motion! But it can be worn hanging straight down as well, since it is a simple post earring. 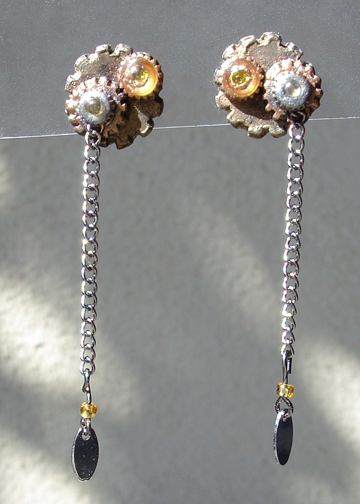 Here is another shot of the earrings taken in sunlight. It shows more of the metallic detail and the tinted resin a little better. I look forward to creating more Steampunk inspired jewelry, and already have some in progress! Stay tuned!